It’s believed that China pioneered the first porcelain whiteboards with steel frames in the 1960s, but America put its own spin on these business essentials when domestic companies marketed them as the answer to chalk allergies! For 50+ years, whiteboards have become go-to alternatives to blackboards and paper pads on easels for myriad reasons, which is why people from all walks of life buy them. Our review runs the gamut from those appropriate for board rooms to products designed for the family ‘fridge. We alphabetized them so you don’t think we favor one over the others! Looking for a whiteboard engineered to fit every circumstance in your busy life? Kedudes 11-x-14-inch whiteboard has your name written all over it. You can mount it on a refrigerator, in a school locker or expect this Kedudes to do double duty at the office as a dry erase board and a place to park notes, mementoes and lists. 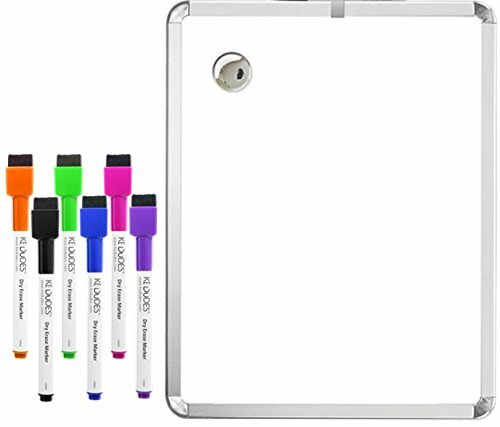 This efficient whiteboard comes with bonuses: 6 colorful fine-point markers and a bonus black marker with a chrome-colored pin clip. The frame is sleek and features rounded silver cornices that won’t prick fingers or scratch walls plus 2 decorative chrome magnets that hold anything from photos to love notes. This whiteboard weighs less than a pound and affixes to multiple surfaces via a combination of magnets and double-sided sticky tape. If these features aren’t incentive enough to convince you of the merits of this purchase we must add that the 6 free markers smell good. Got a sensitive nose? 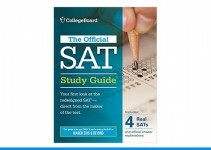 This alone could make your decision! You’ve got to admit that this brand name is impressive and according to those who wouldn’t consider another brand, performance is equally impressive. As Europe’s most popular whiteboard, you don’t have to speak a second language to appreciate its features and benefits. Priced competitively with comparably-sized whiteboards, the Master of Boards surface is magnetized for presentation materials and a roomy pen and eraser tray holds all of the writing aids you require. How does this European-style whiteboard differ from domestic versions? It offers flex-mounting hardware that produces a professional hold and the frame is made from anodized aluminum with extra metal backing to keep the board stable for the long haul. Because the surface of this whiteboard has received a lacquer bath, expect extra years of use and no ugly marker smears or stains, as long as you use a whiteboard cleaning product. 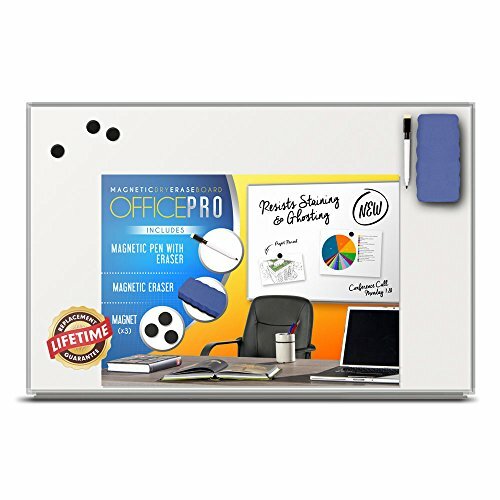 OfficePro not only paid attention to size but also to the need for a slim silhouette with a low profile, thus the 24-x-36-inch Slimline Magnetic Whiteboard was born. While whiteboards are only part of this company’s catalog of office products, sales have been brisk because designers understood that a market existed for a slim presentation vehicle. Scratch resistant and magnetic, the OfficePro Slimline is lightweight and comes with a customized mounting kit that even a novice can handle. The lifetime replacement guarantee differs from competitors; OfficePro wants you to continue to use the brand so if something happens to the old one, they’re happy to send a brand-new replacement. Added to the package are a pen-holder tray, black dry-erase pen and magnetic eraser that sticks to the surface for easy retrieval. Use the free magnets to post documents, but it’s the slim silhouette that’s likely to win your approval most if the affordable price tag doesn’t already have you at sold. Consider this the Cadillac of whiteboards with pricing to match because the Quartet glass whiteboard is heavy, sleek, sophisticated and some have called it elegant. For office designers who seek sophistication in all of the products bought to furnish an office or conference room, this luxurious tempered glass design marries cutting-edge design with practicality. Sold in five sizes, mounting this tempered glass product is best left to someone who knows their way around a tool box, despite the fact that Quartet insists it’s made for effortless installation. 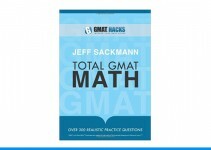 The requisite implement tray is included in the packaging as is a dry-erase marker manufactured by Quartet. 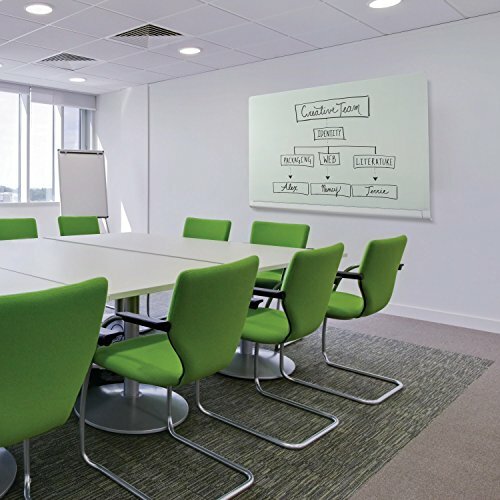 Hang this Quartet glass whiteboard vertically or horizontally, but you’ll quickly discover that one of the biggest attributes of this luxury board is that it functions effortlessly but it’s not obtrusive. 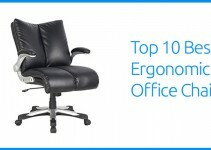 If you love office products that literally blend into the woodwork and won’t compete with high-end furnishings, your search may be over. Unlike lifetime warranties offered by competitive brands, this Quartet glass whiteboard is only covered for 25 years. 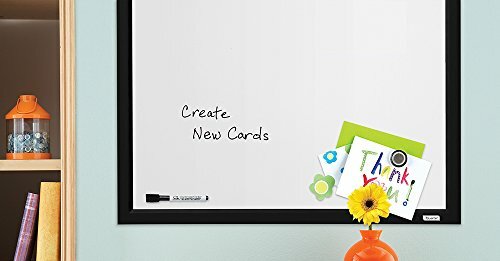 Seeking a small, inexpensive dry erase board with a big pedigree? 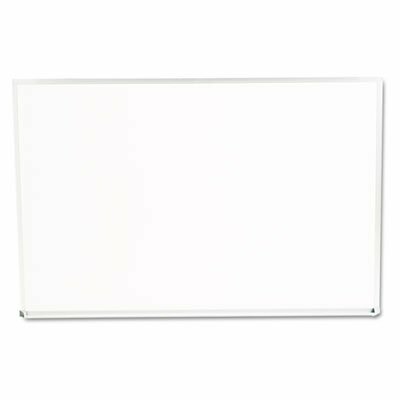 You’ve found it in Quartet’s 17-x-23-inch whiteboard made by the brand that produces the sophisticated glass whiteboard you look forward to owning once you’re in the big leagues! Considered a major name in the office product industry, Quartet devotes as much time, testing and marketing to this practical style as it does to its high-end models, so even though this no-frills product runs less than $15, product quality isn’t compromised. Name a feature found in pricier whiteboards and the Quartet Magnetic Dry Erase model matches up. There’s a hanging kit for efficient mounting, the surface is magnetized so it can be used as a bulletin board in addition to a writing surface for presentations, and because the frame is white, it’s unobtrusive enough to fit into every office décor. Quartet didn’t skimp on extras despite price: you get a dry-erase marker and magnets, too, so until you can afford glass, this whiteboard will do everything you ask of it. You’ve got your job. Your kids. Your community activities. How to juggle it all? With a smart planner that hangs on the ‘fridge so nobody winds up at soccer practice on the wrong night. This surprisingly inexpensive hub may change the way your household operates. It clings to any refrigerator surface and organizes family business courtesy of three color dry-erase pens that come with the whiteboard. That stated, shoppers reviewing this product aren’t as wild about those free markers as they are about the board itself, so buy some non-branded backups just in case. 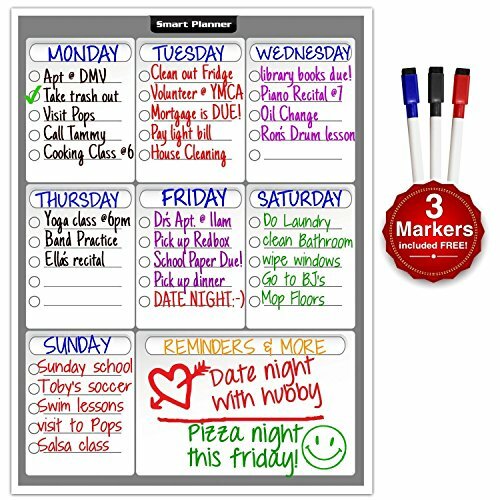 The Smart Planner is shipped with a backer to prevent creasing and curling, while the surface itself is covered with dry-erase over-laminate sheeting that is coated with a clear dry-erase product that doubles down on sealing and bonding. Will this whiteboard make your coffee or guarantee the completion of the kids’ homework? Not likely. But it will build efficiency into your routine when the rest of the world feels out-of-control. If you run a small office, it may be a model of efficiency: coffee pot atop file cabinets, desks pushed together and a single window shared between start-up staff–but you don’t have to compromise on communication tools because the U Brands Comtempo Magnetic Dry Erase Board may be small but it’s mighty. Spend less than $15 to get your messages across, post updates, leave messages and broadcast successes because the Contempo acts like a pricier whiteboard (it won’t stain or ghost) but still fits your bottom line. The easy-peasy mounting system takes seconds to install and no nails have to be driven into the wall because this lightweight whiteboard hangs from double-sided Velcro strips that adhere to any number of surfaces. A Pin-it cork magnet doubles as a bulletin board feature when the surface isn’t being used to track company business or communications. Even the black marker packed with this whiteboard is unique: it’s contoured to stop it from rolling off flat surfaces. 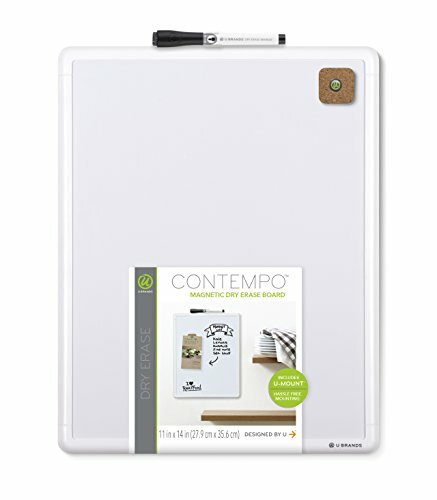 Though sold separately, you can customize this Contempo whiteboard to suit your décor by adding a snap-in frame. 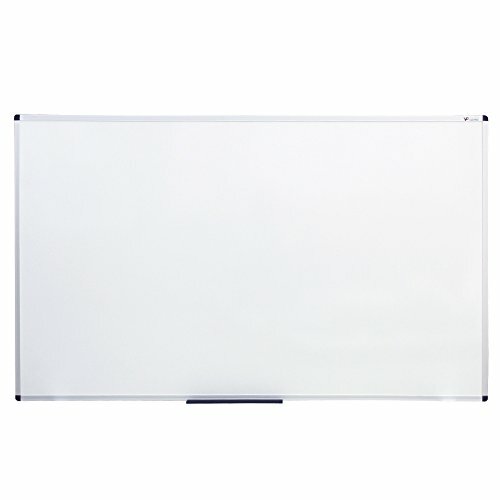 Get the surface medium that gives you the highest readability at an affordable price by selecting this 36-x-24-inch Universal whiteboard fabricated of Melamine, known for wiping clean without leaving telltale residue behind. An attractive addition to your home or office set-up, the aluminum frame is trimmed with plastic corner insets to cut down on scratching and marring mounting surfaces. Because this whiteboard is thicker than price-matching competitors, it won’t warp or bend over time. 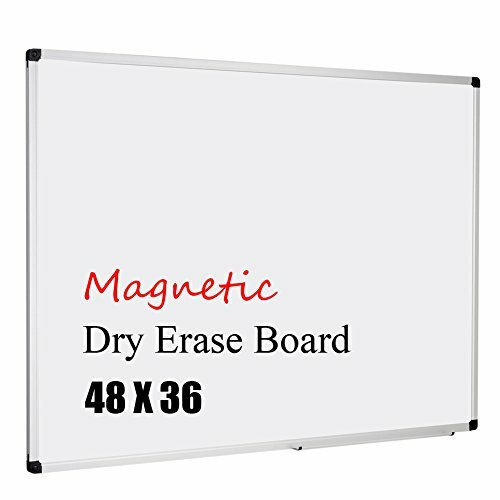 Mount this Universal Dry Erase Board to suit your wall space (horizontally or vertically) and then attach the wide lip tray that’s spacious enough to hold as many writing and erasing implements as you need. Use a damp cloth if marker shadows, ghosts and remnants of pens remain behind. Some consumers familiar with Melamine surfaces recommend buying a whiteboard fluid if you crave a perpetually pristine board. Is there a downside to mounting? Despite its tough demeanor, this Melamine whiteboard weighs only 4 pounds and the material is more delicate than it looks, so take care mounting it. If you drop it by accident, it could warp in the future. Melamine tends to be more expensive than other materials, but the length of service one gets from writing on it can be longer because the material is dense and impermeable. You’ll write a modest check to acquire Viz-Pro’s version of the quintessential whiteboard but you get plenty of quality for your buck: a lightweight aluminum silver-finished frame, a slim profile and plastic corners that curve so wall scratches are avoided when hung using the “easy fixing kit” with explicit directions. Because Melamine is a non-magnetic surface, you won’t be able to use magnets to hang materials but you can still support your presentation or communications by using tape to make sure materials stay put. On the other hand, you won’t find a smoother surface than Melamine, so if you’re fastidious about a true white board, this one will clean up better than other material surfaces. Viz-Pro recommends using quality markers if you want to keep your whiteboard looking new into the future. 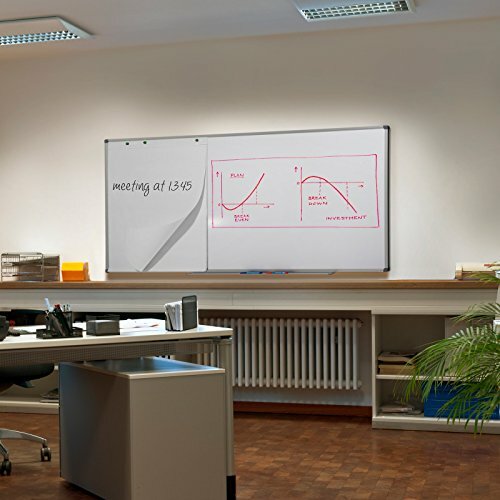 Affordability and versatility are then hallmarks of this wall-mount whiteboard brand that offers user sizes that range from 36-x-24-inches to an expansive 48-x-36-inch board ideal for larger offices, break and conference rooms. Made of silver-anodized aluminum, this product is lightweight and features ABS corner material without sharp edges. The coated steel writing surface has been tested and found durable and reliable. The XBoard can be hung vertically or horizontally. This whiteboard’s surface has been treated with a protective coating, so it’s not likely that this magnetic surface is going to be subject to scratches. Hardware is included, so anyone comfortable wielding a hammer should be able to hang the Xboard quickly. A lifetime manufacturer’s guarantee makes this whiteboard especially practical–just in case you worry that it may need to be replaced down the road.